Rough Rider’s Genuine Affordable Stag! I own very little stag. 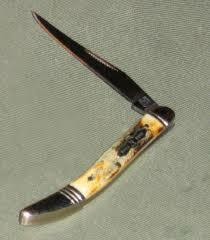 When it comes to Stag on a USA made knife, I normally can’t afford it. When it comes to stag on a global knife, it has always reminded me a poorly jigged plastic. Over time, I brainwashed myself into thinking stag looked like poorly cut tree bark and decided not to bother with it. It was either thinking that, or developing an unhealthy medical condition known as stag envy. Upon mentioning to Steve Koontz and Tony Watkins that I've developed a liking for Peanuts, Mr. Koontz recommend I pick up the RR663, the stag peanut, because they were being discontinued. That was enough to make me buy Rough Rider 665 Stag Toothpick a 663 Stag Peanut and now I think I’m going to regret my stand against buying stag if I'm unable to get any more of these Rough Rider Stag knives.. These two affordably priced small pattern pocket knives are on par with American made knives that cost 3-4 times the price. The stag is simply beautiful. There is no mistaking it for bone, Delrin and poorly cut tree bark. And the finish is simply fantastic. The brass pins, liners, shields, and bolsters all line up beautifully with securely attached stag scales.The spines of both knives are also smooth with very little grooving as you pass your finger from side to side. Blade side view of both knives. Spine (spring) view of both knives. Blades have a excellent walk & talk, however, if you’re use to the half stop on a Case peanut, you won’t find it on the Rough Rider; the blades on both knives snap to the full open or closed position. On a plus side, the small pen blade on the peanut is not nearly as hard to open as it is on my Case peanuts! Those who own Case peanuts, know what I’m talking about! Stay & play is also excellent. Blades open and stay where they need to be with little or no wobble. And as you can expect with almost all Rough Rider knives, the blades are made with 440A “Razor Sharp” Stainless steel with an HRC right at 56, making it on par with the blade steel used by Victorinox and Case knives. If you’ve never thought about taking the Rough Rider Challenge, and you like Stag, then maybe it’s time you took the plunge. But you better not wait long if you’re hoping to purchase quality, affordable stag knives. Rough Rider has discontinued Stag production and currently has no plans to ever make knives with stag handles again. Mark (obverse) side view of both knives. Reverse side view of both knives. This decision may make the Rough Rider Genuine Stag knives be the first Rough Riders to go from being a Collectible to an actual Collector’s Items*. From what I understand, they only made two runs of the Stag knives. The first run had the round horseshoe shield and the second run the propeller shield as seen in my examples. The knives normally sold for around $15. Most are already out of stock and SMKW and Blue Ridge, meaning all existing stock is being sold in the secondary markets, often at double the original selling price. Now maybe that is just a temporary spike in price or maybe it is a sign of things to come. Who knows? What I can say, is I’ve seen the same thing happening to the Rough Rider Pearl knives and the Moonshiner Series. Wait around if you want to, but I think affordable quality stag maybe be gone before you know it. I’m going to try and grab some more before it is too late! Mark (obverse) side view of both knives, blades open. * Collectible: a collectible is something made for the purpose of collecting. This has no bearing on the actual quality or quantity of the item. Often reproductions or commemorative items are considered collectible. They rarely go up in value. Collector’s Item: Normally, an older, out of production item with a known appraised value and a demand that out strips current product availability.